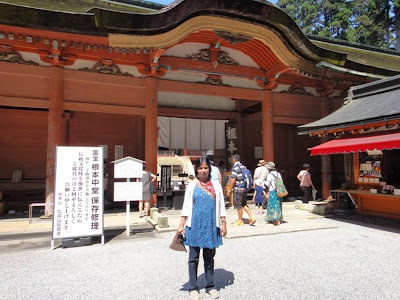 On 13th August, hubby and I visited Enryakuji Temple. 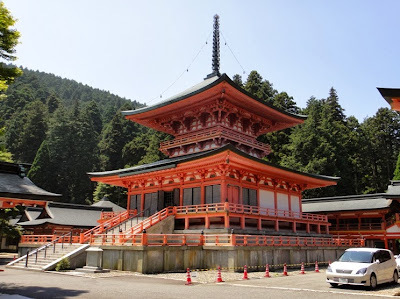 The temple is located on Mount Hieizan in Otsu City of Shiga prefecture. The 848-meters-high Mount Hieizan lies on the border of Kyoto and Shiga prefectures, and therefore Enryakuji Temple overlooks Kyoto in the west and Lake Biwa in the east. 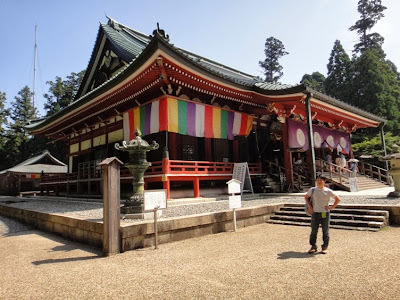 Enryakuji Temple is a monastery and is the headquarters of Tendai Sect of Japanese Buddhism. 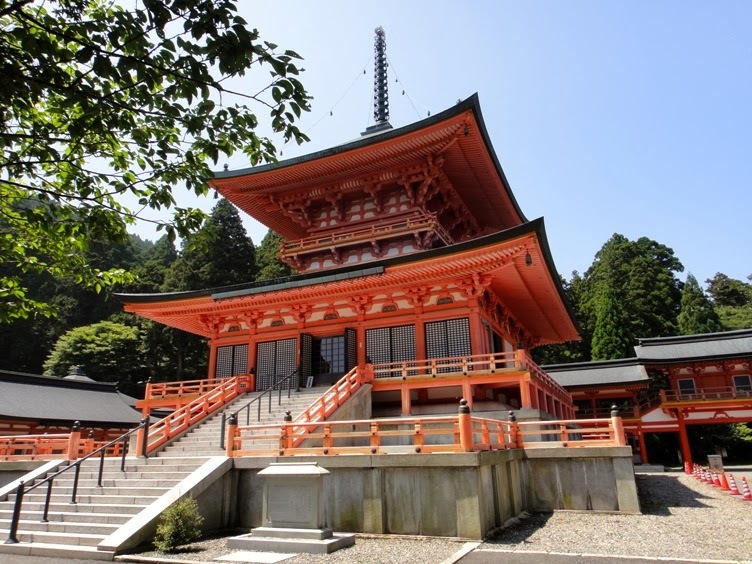 The temple was founded by a monk named Saicho in the year 788. Saicho, also known posthumously as Dengyo Daishi, introduced the Tendai Sect of Buddhism to Japan from China. The temple gradually grew in power, and for 1225 years since then, the temple has produced many distinguished and influential priests including the founders of a number of later Buddhist sects, such as Jodo-shu, Jodo-shinshu, Soto Zen, Rinzai, and Nichiren. 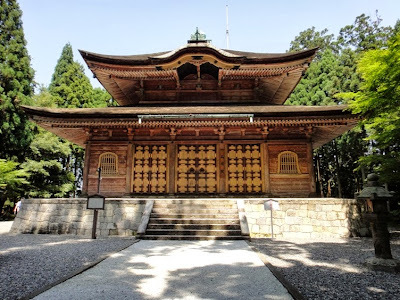 At its peak, Enryakuji had as many as 3000 sub-temples and a powerful army of warrior monks called Sohei who often engaged in power struggles with other monasteries and political leaders. Warlord Oda Nobunaga was a predominant force of Japan in the late 16th century. 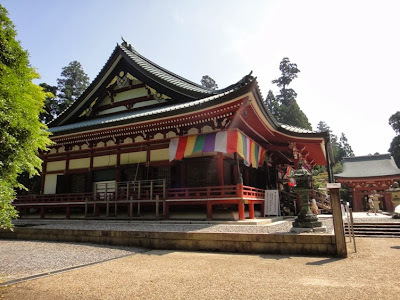 On his way to remove all potential rivals and unify the country, Nobunaga saw the power of Enryakuji Temple as a threat to his aims, and so he ended this Buddhist militancy in 1571 by attacking the temple and destroying it. Nobunaga burned down most of the temple buildings, and killed almost all inhabitants including monks, women, and children. 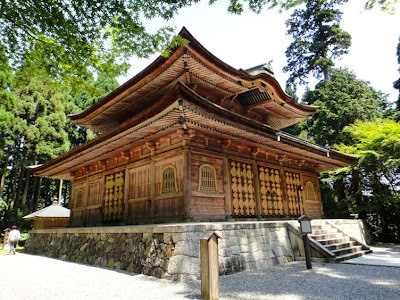 Following a change of government, the temple was reconstructed and most of the current buildings of the temple date from the latter half of the 16th century to the first half of the 17th century. Today the temple area is dotted with about 120 buildings and towers, and is divided into three areas, namely, To-do (east area), Sai-to (west area), and Yokawa. To-do is the main area of the temple, where the monastery was originally founded and where most of the important buildings of the temple are located. Sai-to area is downhill from To-do, and also features a few important buildings. 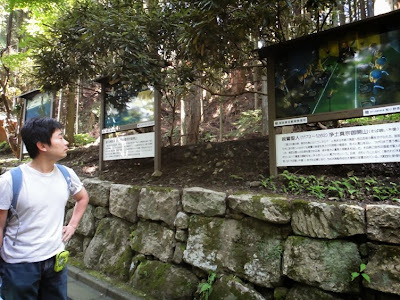 Yokawa area is more isolated and less visited. The temple is one of the most significant monasteries in Japan, and has great historical and artistic value. 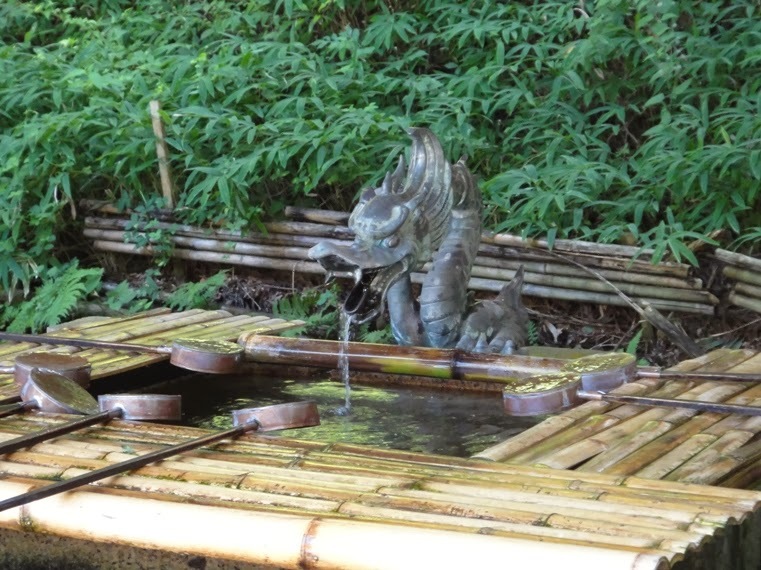 The temple is designated as a government historic site, and the temple grounds contain ten national treasures and over fifty important cultural properties. 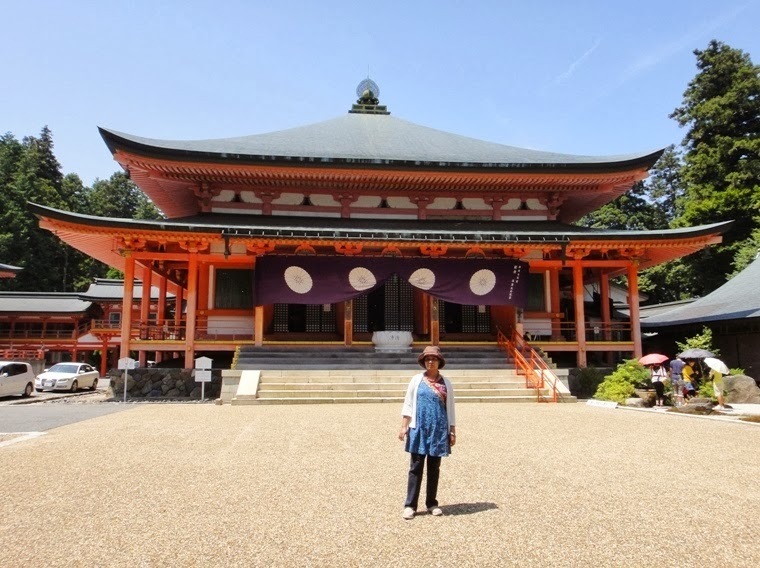 In 1994, the temple was registered as a part of the UNESCO World Heritage Site ‘Historic Monuments of Ancient Kyoto (Kyoto, Uji and Otsu Cities)’. 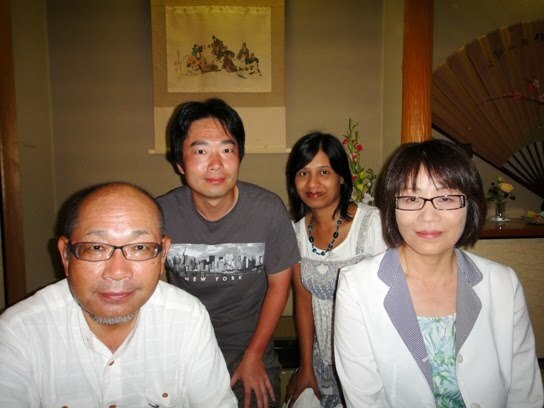 On 13th August, hubby and I had an early breakfast at the hotel in Shiga City where we had stayed for the night, and left for Enryakuji Temple at about 9 am. The temple is located just 14 kilometers north-northwest of the hotel, and it took us about 30 minutes of car ride to reach the car parking area of To-do, which is the main area of the temple. 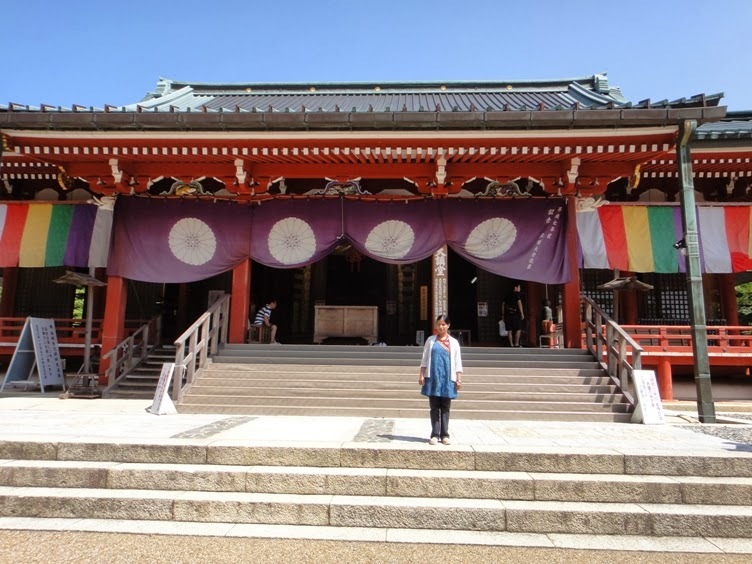 We purchased tickets worth 1000 Yen per person as admission fee to enter all the three areas of the temple, To-do, Sai-to, and Yokawa. The tickets also allowed us to visit a museum in To-do area but we skipped visiting the museum as we did not have much time. We entered the To-do area and walked along a paved pathway. On either side of the pathway, we saw colorful posters that explain the history of Enryakuji Temple. 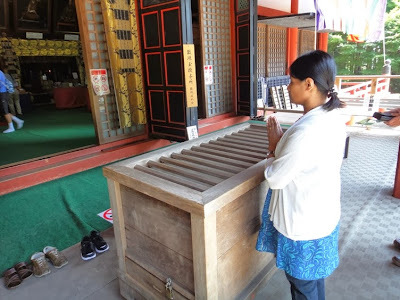 After walking along the paved pathway in To-do area of the temple for about three minutes, we reached a building named Daiko-do. 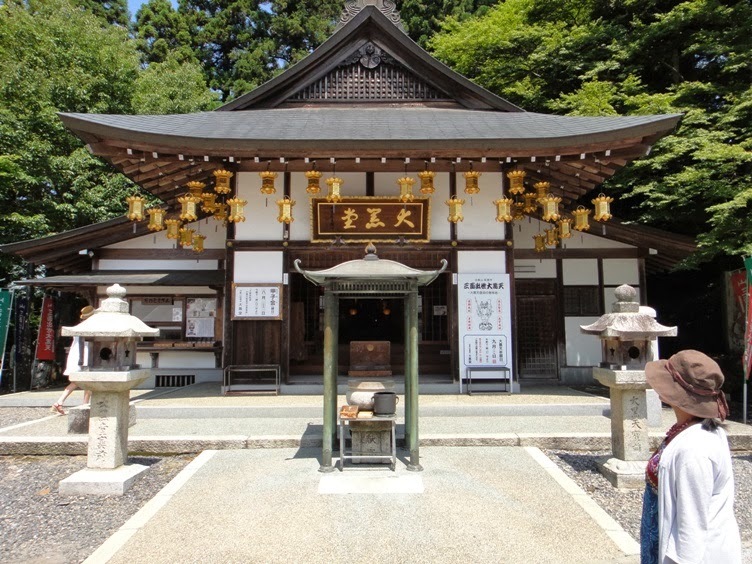 Daiko-do was constructed by the first Chief Tendai Abbot (Zasu) named Gishin in the year 824. The building is a Dojo training hall, and is used by the monks to research, discuss, and have debates to deepen their Buddhist studies. 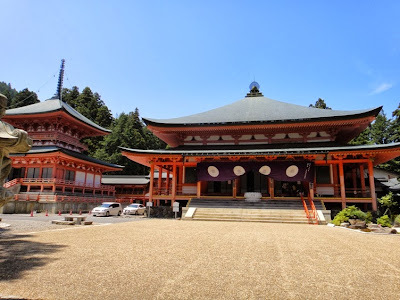 The traditional ceremony of ‘Hokkedaie Kogakuryugi’, started by the 18th Zasu Jie Daishi Ryogen, continues to be an important ceremony that is held every four years in this hall for those trainee monks stepping into the position of full-fledged Tendai sect priests. 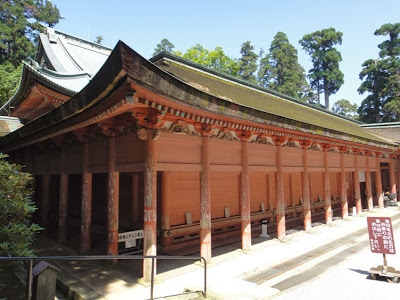 After Oda Nobunaga burned down all the buildings of the temple in 1571, Daiko-do was reconstructed in 1634. But the building burned down in 1956. So another building named Sanbutsudo of Toshogu Shrine located in Sakamoto Town at the foot of Mount Hieizan, was relocated to the original Daiko-do site in To-do area, and reconstructed as the present Daiko-do building in 1964. The principal statue enshrined inside this building is Dainichi Nyorai. 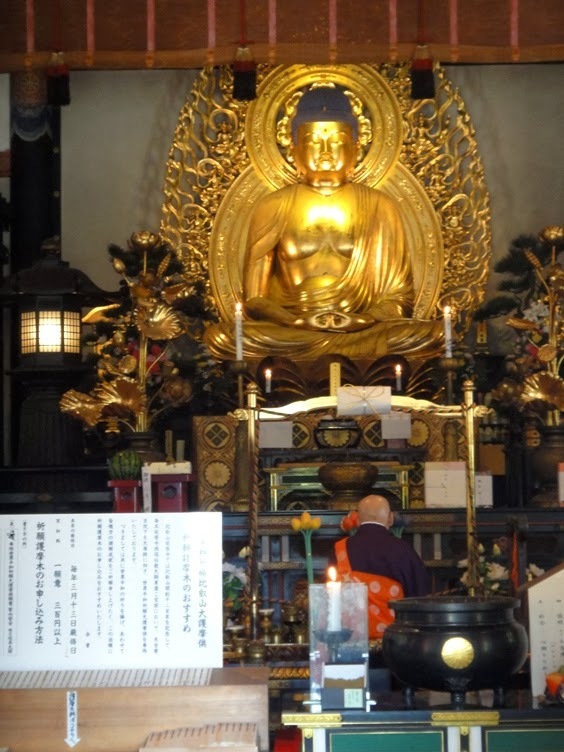 On either side of the principal statue, wooden statues of the founders of various sects of Buddhism who trained in Mount Hieizan are also enshrined. The present Daiko-do building is designated as an important cultural asset. We loved the building architecture and took photos of it from various positions and angles. 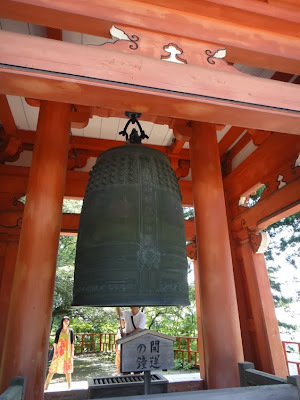 I prayed at Daiko-do Hall and also rang a huge bell located to the southeast of the building. I compiled a video of me ringing the bell. Next we started walking along the paved pathway towards the east side of To-do area. 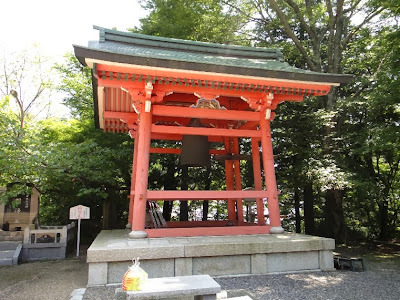 While going downhill from Daiko-do towards another building named Konpon Chu-do, we saw a small stone Shinto Shrine named Toten Tenmangu located to our left side adjacent to the pathway. Legend has it that after the death of Sugawara no Michizane in 903, his angry spirit caused a lot of damage in Kyoto area which included Mount Hieizan. 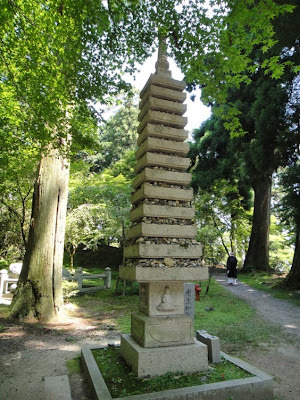 The 13th Tendai Zasu Son-i Osho placated his spirit and deified him as Tenjin in this shrine. 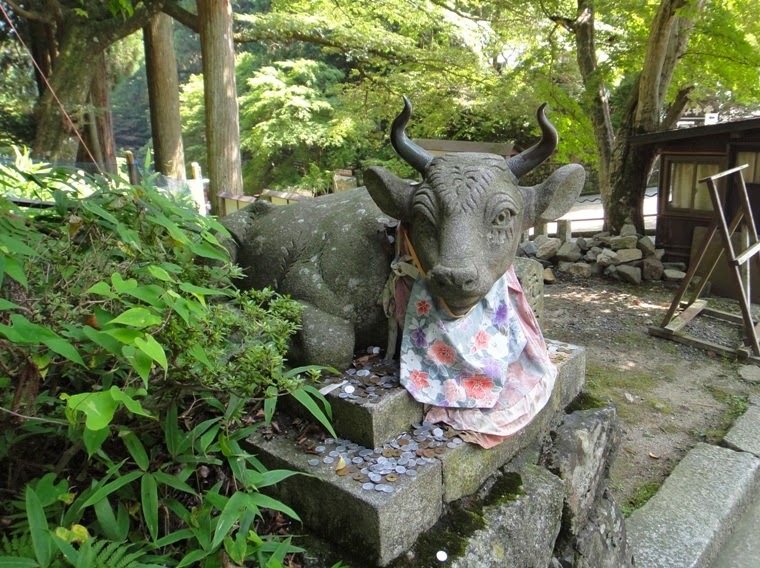 In front of the shrine, there is a stone statue of an ox. This statue called Nade Ushi is the Zodiac sign of the year Sugawara no Michizane was born, and it is also considered to be Michizane’s messenger. It is said that if we rub the statue it will bring good luck to us. I rubbed the head of the ox and was reminded of the statues of Nandi bull that I had seen in my early childhood in India. Anyway, I really liked this peaceful existence of Shinto Shrine and Buddhist Temple on Mount Hieizan. From Daiko-do, we walked along the paved pathway for about two minutes, and then went down a few stone steps and reached Konpon Chu-do building from its south side. Konpon Chu-do is the most important central temple on Mount Hieizan and is the main temple of the Tendai sect in Japan. 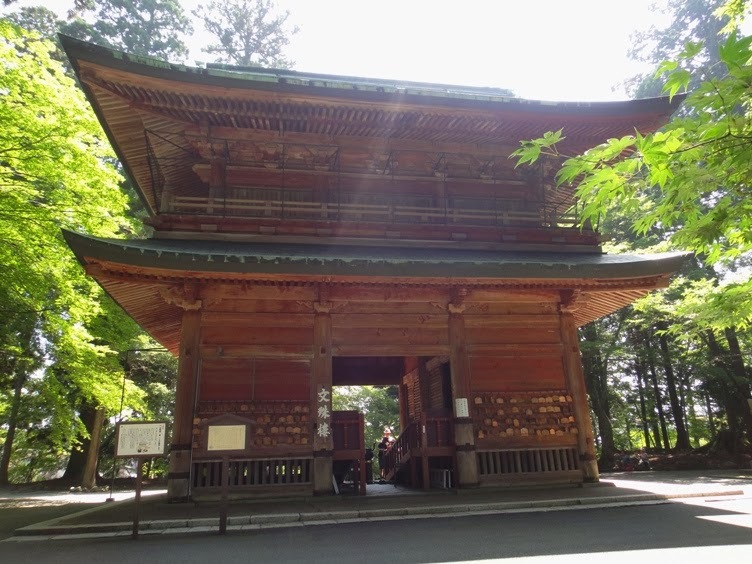 It is a single-storied wooden structure and has been designated a national treasure. 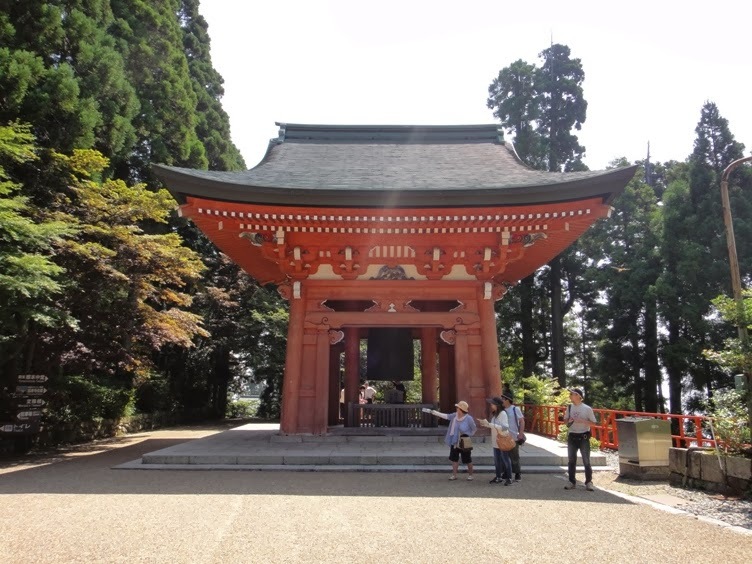 The original structure was established at the present site of Konpon Chu-do by the founder of Tendai sect Dengyo Daishi Saicho in 788. It was a small scale temple called Yakushi-do, which was a hall for the worship of Yakushi Nyorai or the Healing Buddha. 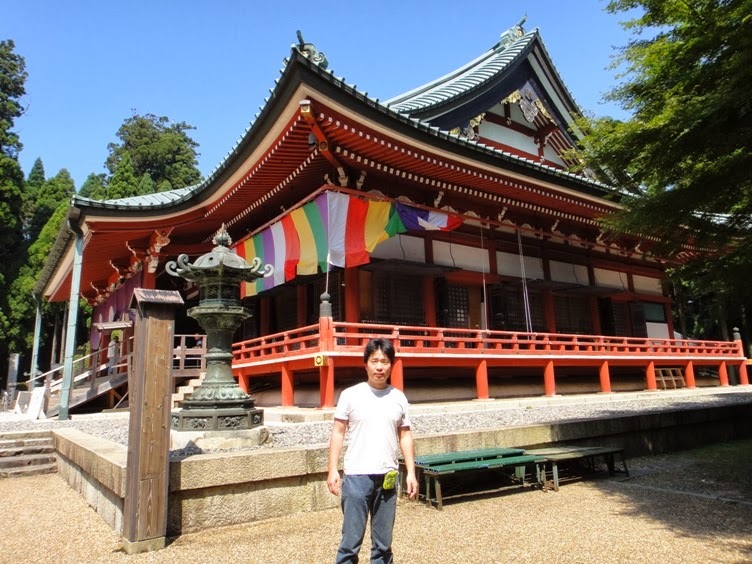 He built this temple so that he could pray for peace in Japan and called it Ichijoshikan-in Temple. This small temple hall met with disaster many times. And every time the temple hall was rebuilt, it became bigger and complex. In addition, in the 9th century this hall became flanked on either side by a hall named Monju-do for the worship of Monju Bosatsu, and another hall named Kyozo Sutra Repository. After Oda Nobunaga burned down all the buildings of Enryakuji Temple in 1571, Shogun Tokugawa Iemitsu commissioned the building of the present-day Konpon Chu-do structure with its unique architectural style in 1634. The basic floor plan for Konpon Chu-do came about when the three separate buildings of Yakushi-do, Monju-do, and Kyozo were consolidated under a single roof. The building as it exists today was completed in 1642. The building has an architectural style that is typical for the main hall of a temple of the Tendai sect, with an outer section floored with boards and an inner section whose earthen floor is about 3 meters lower. The building is painted in several different colors and is surrounding by a covered corridor. At 37.6 meters wide, 23.9 meters deep, and 24.2 meters tall, it is a rather large wooden building with Irimoya style roof. The principal statue enshrined at Konpon Chu-do is a hidden wooden statue of Yakushi Nyorai, which is believed to have been hand carved by Dengyo Daishi Saicho himself. 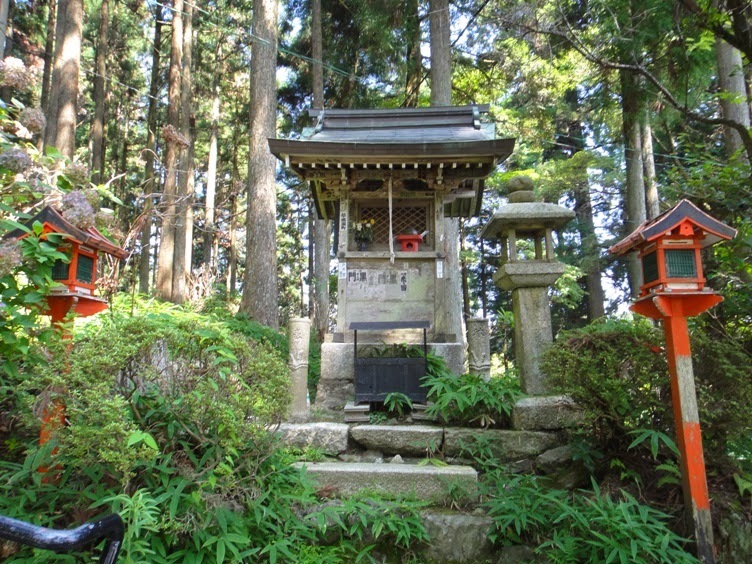 The lanterns placed in front of Yakushi Nyorai are called ‘Fumetsu no Hoto’ or ‘the ever-burning Dharma lights’. They have been burning perpetually since the establishment of the temple 1225 years ago. Goma the religious service to pray for peace and prosperity of the country and the people is performed here daily. We loved viewing Konpon Chu-do very much. It is an exquisite building and we took several photos of the building from various positions and angles. The building is so wide that we could not take the photo of the entire building from the ground in front of the building. So we climbed up a few steps of a stone staircase located right in front (east) of the building, and clicked a photo of the entire building. 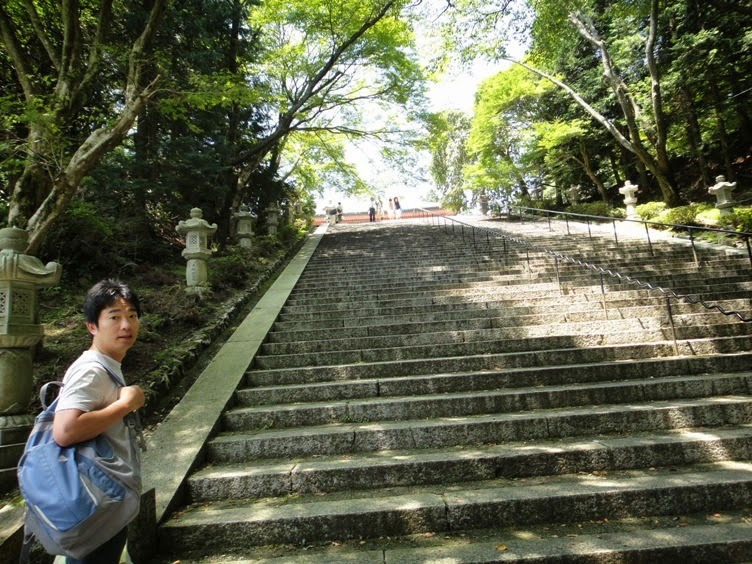 Later we walked back down these steps, and saw a Temizuya located adjacent to the staircase. Temizuya is a hand washing basin located inside a four pillared pavilion. We washed our hands with water at the basin and purified ourselves. 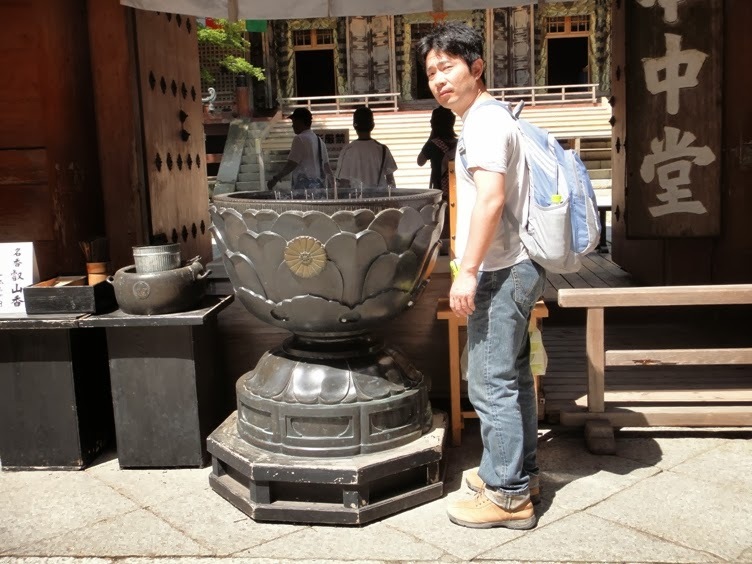 We also saw a large cauldron for burning incense sticks placed at the entrance area of the building. We wafted incense fumes over our body, which is believed to bestow good health. Next, we entered inside the building and prayed. We loved the peace and serenity inside the building. Unfortunately, photography is not allowed inside the building. Afterwards, we climbed up the stone staircase located in front of Konpon Chu-do and left this building area. Hubby standing on the building ground along with the staircase in the background. A gigantic wooden column inscribed with holy text stands tall in front of the building. We climbed up the staircase and at the top we saw another building named Monju-ro located to the east of Konpon Chu-do. Monju-ro was founded by Jikaku Daishi Ennin in the year 868 following the Monju Bosatsu-do building of Mount Wutai in China. 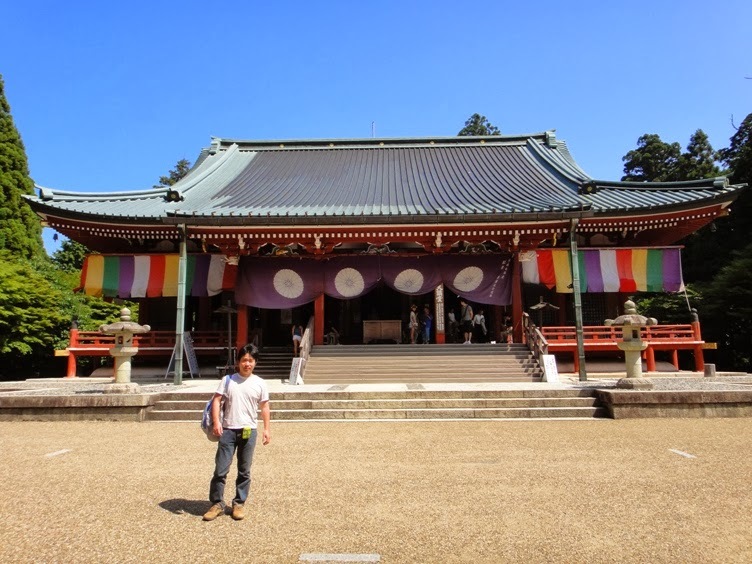 He made this temple on Mount Hieizan to continue his practice of Nembutsu. 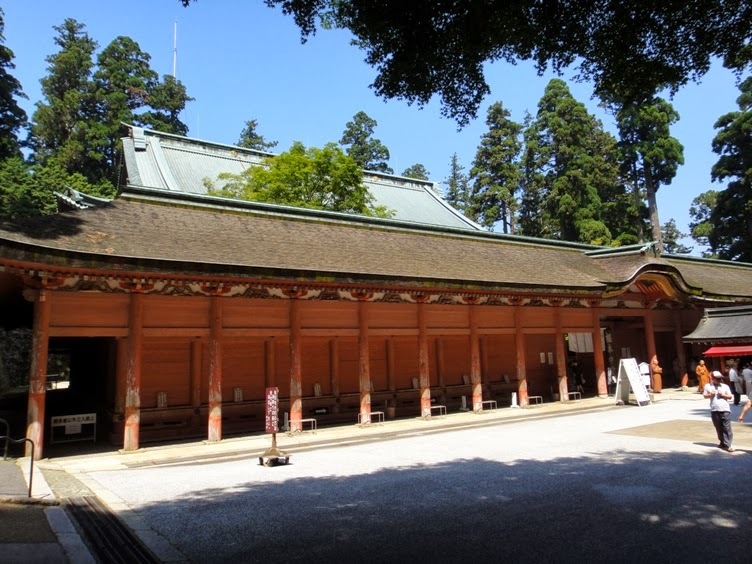 After the building was razed by Oda Nobunaga in a battle in 1571, Tokugawa Iemitsu ordered its reconstruction in 1642. But that building burned down in 1668, following which this present structure was built. 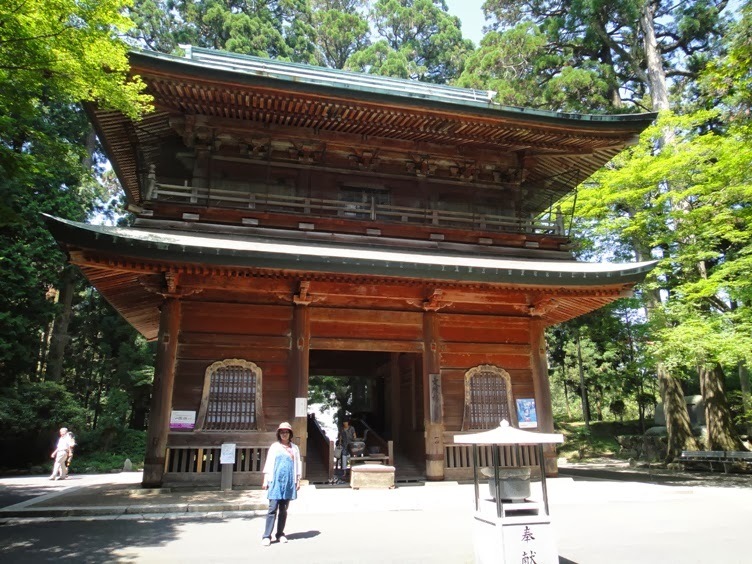 It is a two storied structure and is considered to be the Seimon Main Gate of Konpon Chu-do. 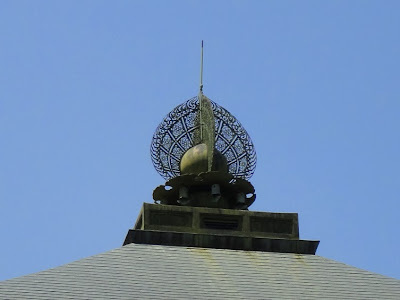 The principal statue enshrined at the second floor of this building is Monju Bosatsu. 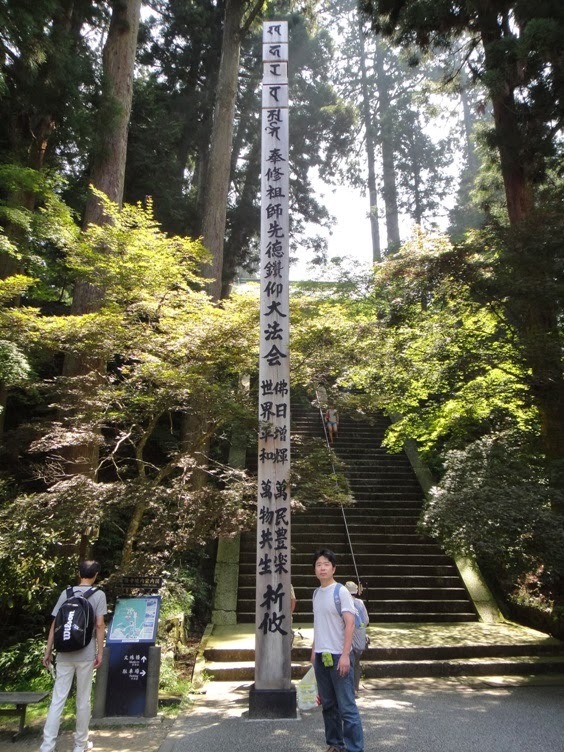 It is a god of wisdom, and students from entire Japan visit this temple to pray for achieving success in examination. We loved the architecture of Monju-ro and took several photos of the building from various positions and angles. 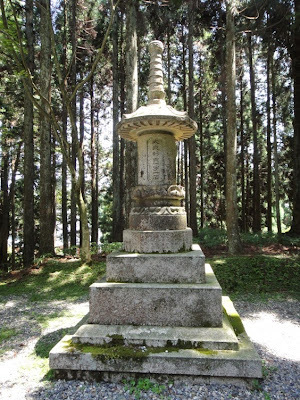 Adjacent to Monju-ro, we saw a thirteen-storied stone pagoda. 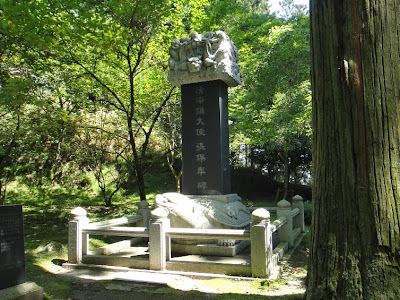 Near Monju-ro, we also saw a stone monument named ‘Chonhejin Taishi Cho Hoko Hi’, which is a monument erected in honor of Jang Bogo (Cho Hoko - Japanese pronunciation) who was the ambassador of Cheonghaejin (Chonhejin - Japanese pronunciation) in the ninth century. 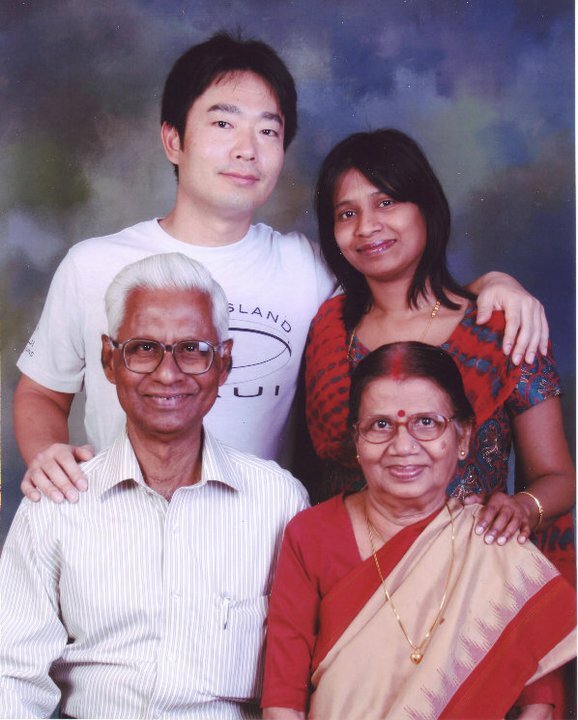 Jang Bogo started sea trade with Japan and brought a variety of tea seeds from his country (Korea). In the early ninth century, tea was just getting introduced in Japan and his trade was very important. In addition, Jikaku Daishi Ennin made a pilgrimage to China in 838 and relied upon the maritime abilities of Jang Bogo to reach China and return. The stone monument is 4.2 meters high and looks grand. 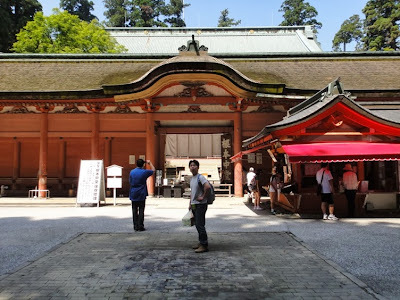 We continued walking along the paved pathway, and on our way we saw yet another building named Daikokuten-do. 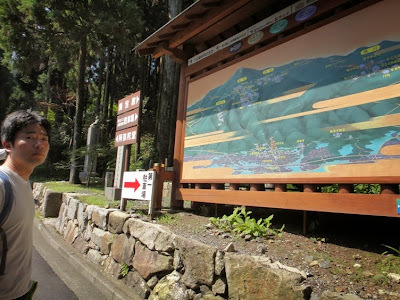 Daikokuten-do is located about 60 meters southeast of Konpon Chu-do. 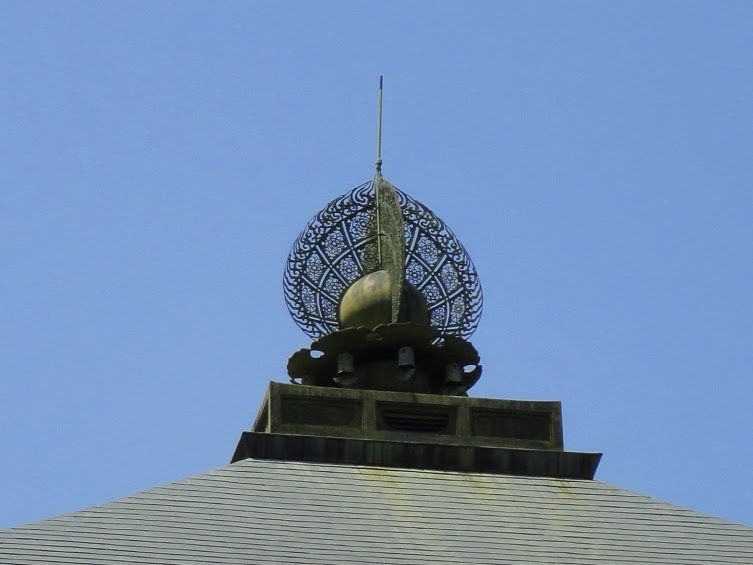 When Dengyo Daishi Saicho established the main temple Konpon Chu-do, he also enshrined a Buddhist image of the deity Daikokuten at a nearby building. That building is Daikokuten-do, where he prayed for peace on Mount Hieizan and prosperity for the people. The deity is also known as ‘Shusse Daikokuten’, and the Buddhist followers believe that the deity will reward them with success. 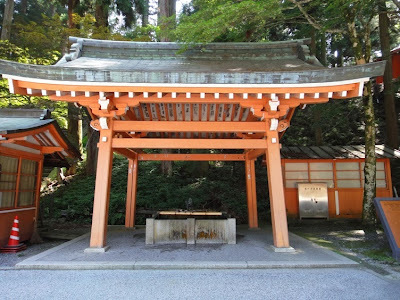 It is said to be the birthplace of Daikokuten faith in Japan. In front of the building we saw a stone prayer wheel called Manikuruma, which can alternatively be pronounced as Manisha. 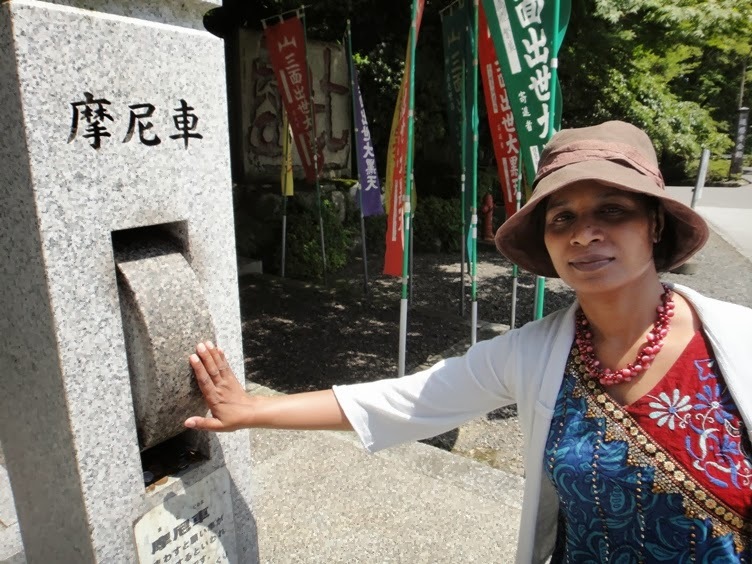 Whenever I see such prayer wheels at various temples in Japan, I remember the Kanji characters that can be used for my first name. 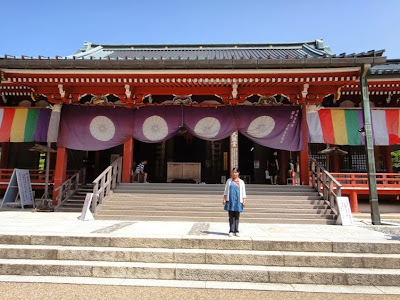 From Daikokuten-do, we walked along the paved pathway for about 300 meters and reached the southwest corner of To-do area where two buildings named Amida-do and Hokke Soji-in To-do (not to be confused with To-do area) are located. These two buildings are situated on a slightly elevated ground and there is a stone staircase to reach the site. We climbed up the staircase, and on reaching the top we saw that the two buildings are located adjacent to each other. 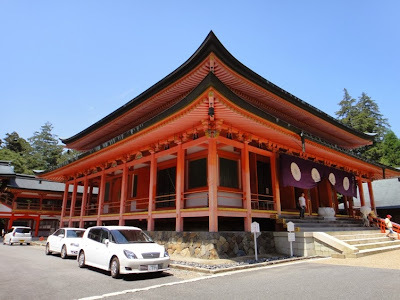 Both are gorgeous red colored wooden buildings. We also saw a belfry and a bell, a stone Stupa, and several stone statues of Buddhist deities in the temple ground. 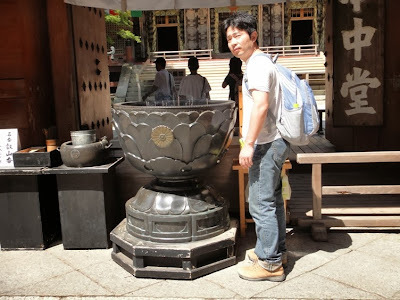 I will write about Amida-do and Hokke Soji-in buildings separately in the next couple of paragraphs. After climbing up the staircase, we saw Amida-do building located right in front of us. The building faces eastward. 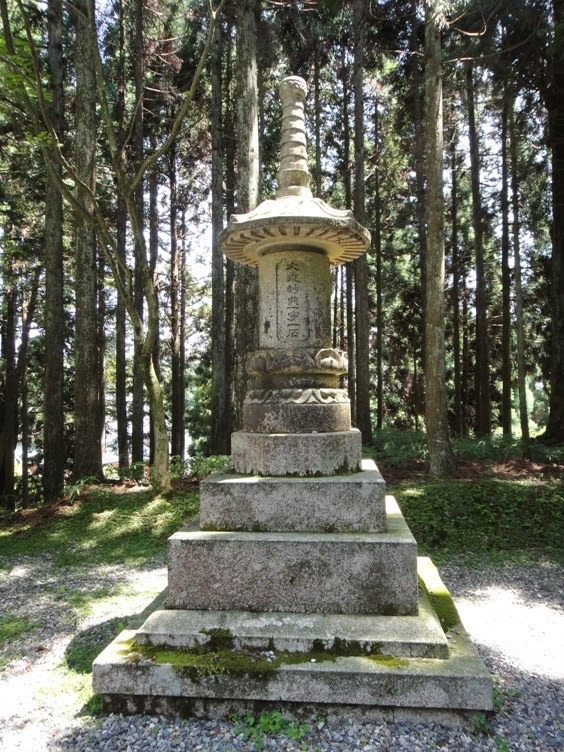 Amida-do was built in 1937 to commemorate the 1150th anniversary of the establishment of Enryakuji Temple on Mount Hieizan. 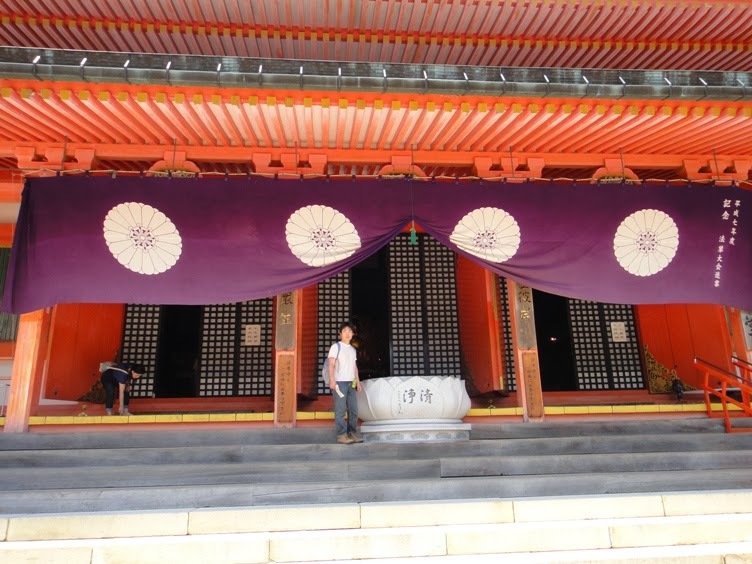 Traditional Japanese style architecture was adopted for the temple structure and the interior. 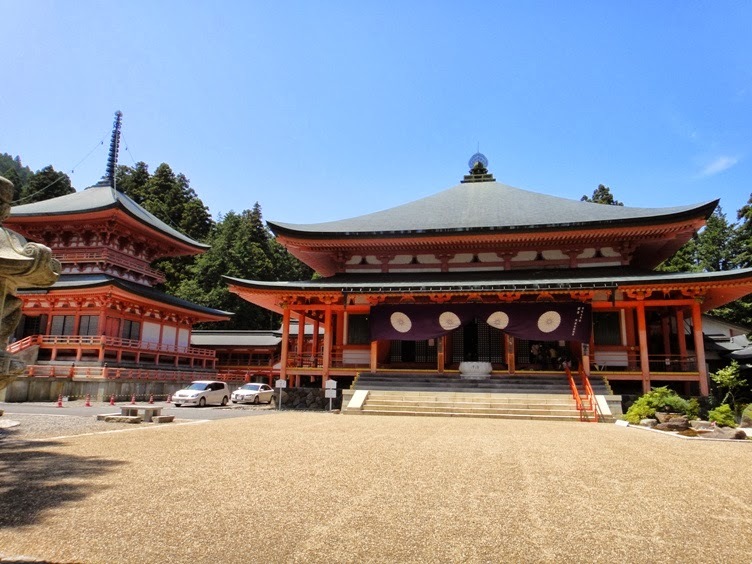 The principal image enshrined inside this building is a huge statue of Amida Nyorai that was crafted by a famous sculptor named Naito Koeski. Amida-do is a temple for holding memorial services for the deceased or the ancestors of the believers of Tendai sect Buddhism. Memorial services called ‘Eko’ are held here every day. 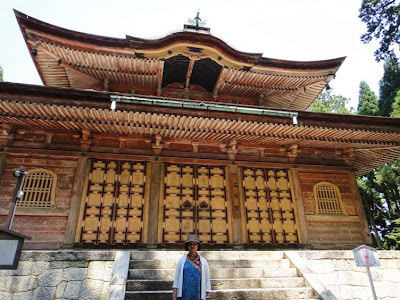 We loved the building architecture and took several photos of Amida-do from various positions and angles. 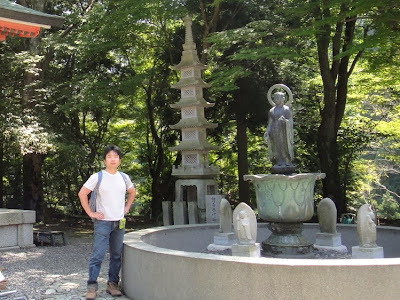 Afterwards I prayed in front of the statue of Amida Nyorai. Adjacent to Amida-do, to its south, we saw a building named To-do (not to be confused with To-do area) of Hokke Soji-in Temple. Hokke Soji-in is the main training hall (Konpon Dojo) of Tendai Esoteric Buddhism (Taimitsu). 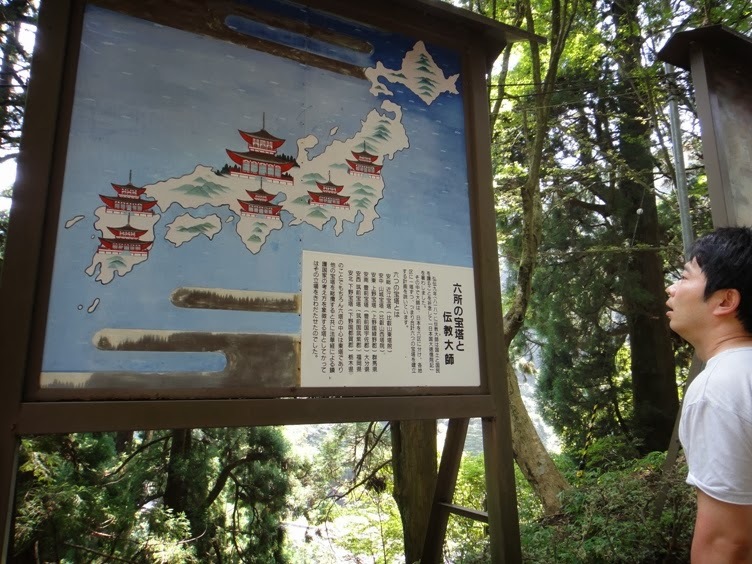 It was planned by Dengyo Daishi Saicho and was founded by Jikaku Daishi Ennin in 862. This training hall was tragically burned down by Oda Nobunaga in 1571. 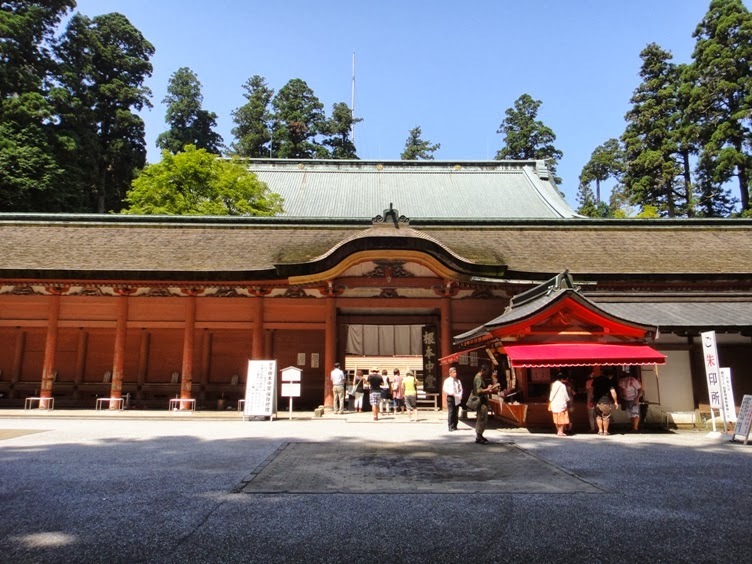 It was then rebuilt in 1980 with donations from Sagawa Kiyoshi, the founder of Sagawa Kyubin Group. To-do building was resurrected after 400 years and restored to its original grand appearance. 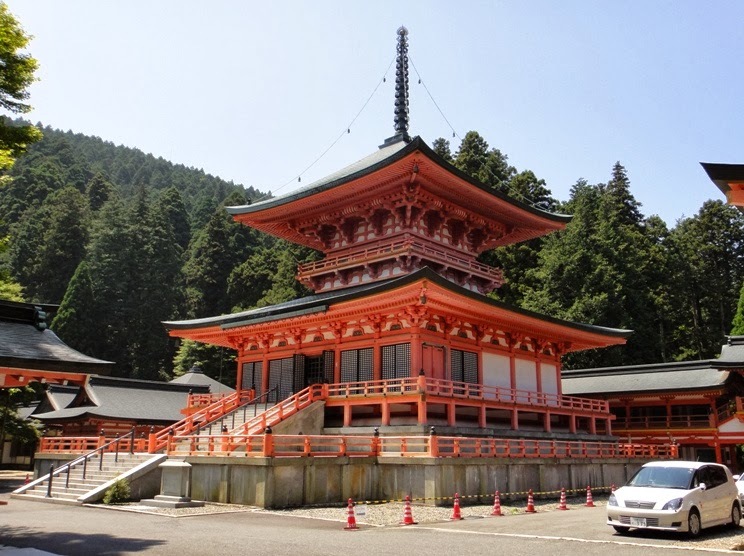 It is a 30-meter-tall two-storied wooden pagoda tower made with Japanese cypress. It has an architectural style of Tahoto Pagoda, but unlike the normal Tahoto Pagoda, the upper story of this pagoda is square-shaped rather than cylindrical. The principal statue Dainichi Nyorai, Gochi Nyorai, and other statues are enshrined in the lower story of the pagoda, while the relics of Buddha and Hokekyo Lotus Sutras are kept in the upper story of the pagoda. 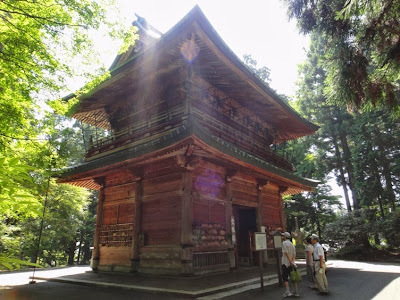 Adjacent to To-do pagoda, to its south there are two more prayer buildings named Jakko-do and Kanjo-do. 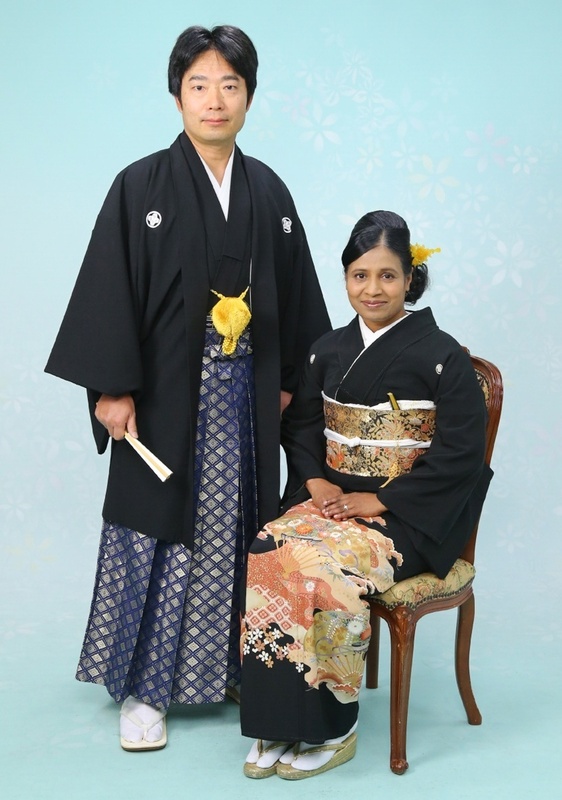 The To-do, Jakko-do, and Kanjo-do are collectively referred to as Hokke Soji-in. Visitors are not allowed to enter Jakko-do and Kanjo-do buildings. 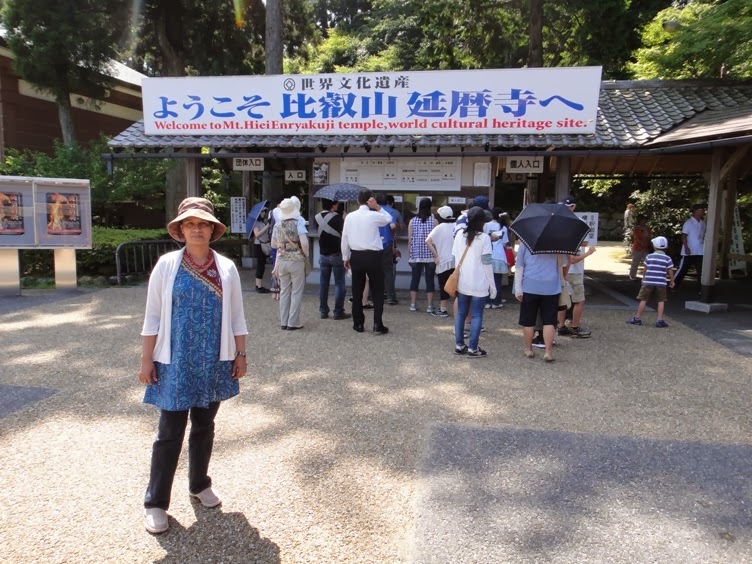 Afterwards we left the ground of Amida-do and Hokke Soji-in buildings. We went back down the staircase and walked along the paved pathway towards the northeast direction for about 70 meters and saw a building named Kaidan-in. This building is an important temple on Mount Hieizan where aspiring priests of the Tendai Buddhist sect are ordained as Buddhist priests by receiving the commandments of Buddhism. Dengyo Daishi Saicho, the founder of Tendai sect, devoted his life and soul to Enryakuji Temple. He passed away in the year 822, and a week after his death, Emperor Saga issued an imperial permit to build Kaidan-in Temple. 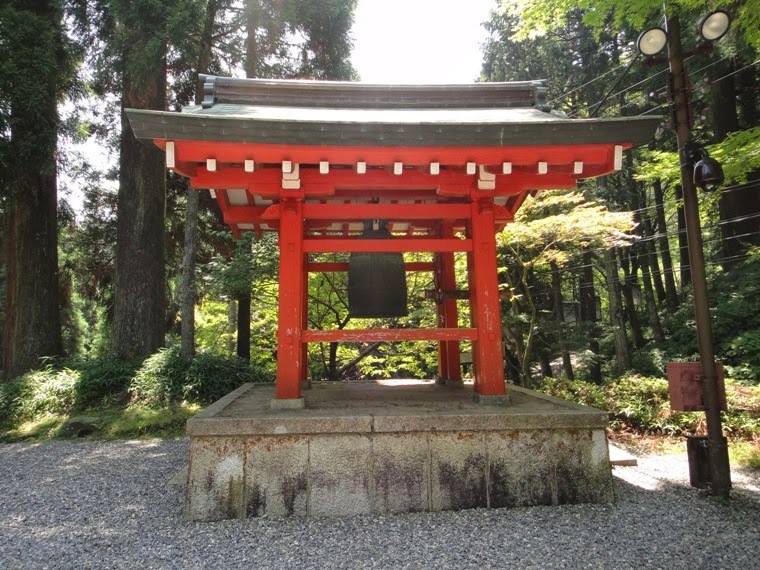 Gishin, the first Tendai Zasu, constructed Kaidan-in in the year 828. The principal statue enshrined inside this building is Shaka Nyorai. 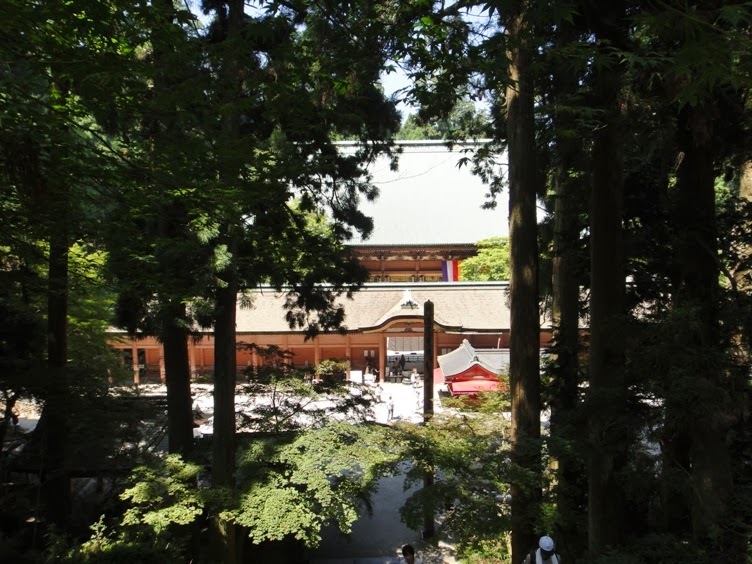 Kaidan-in building is designated as an important cultural asset. 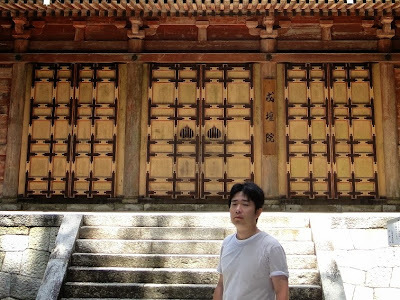 We loved viewing this elegant wooden building having exquisite doors. 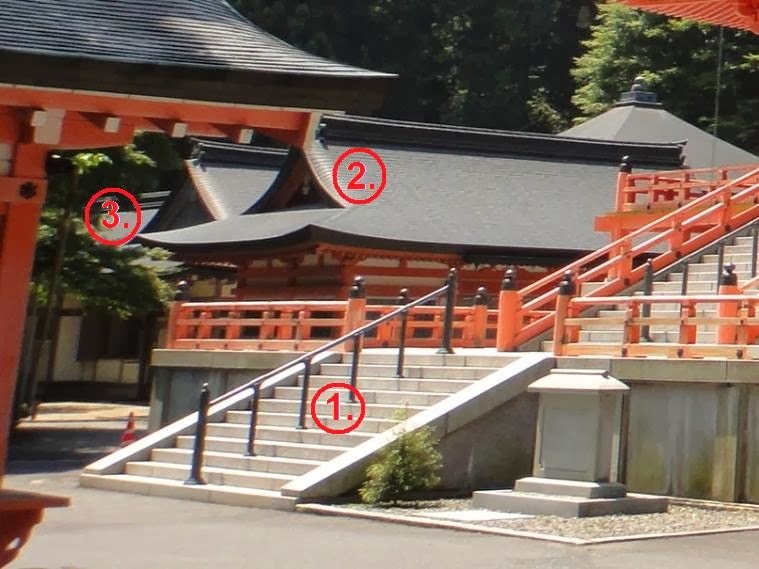 We took several photos of Kaidan-in from various positions and angles. We also saw a belfry and a bell, as well as a stone Stupa in the building ground. 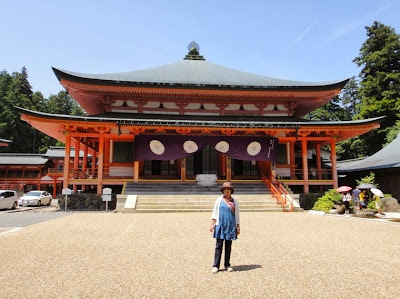 At this point, we finished the tour of To-do main area of Enryakuji Temple on Mount Hieizan. We loved viewing all the buildings in To-do area. 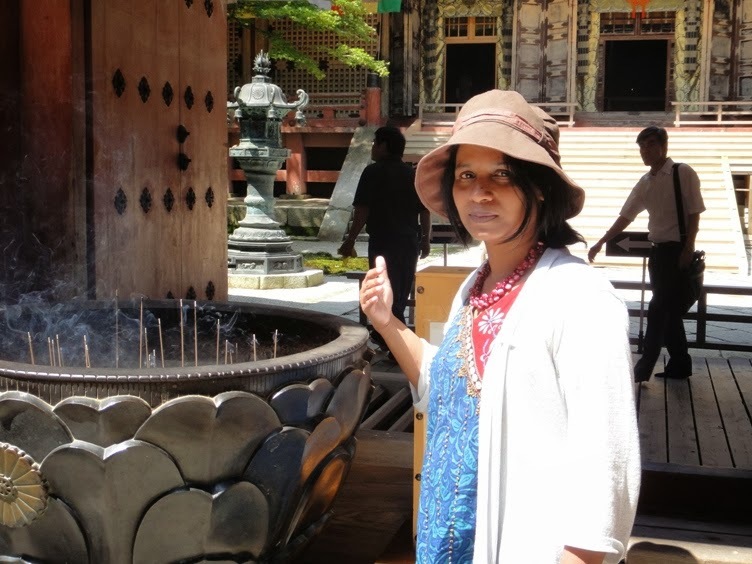 Afterwards we visited Sai-to area and Yokawa area of the temple complex on the mountain. 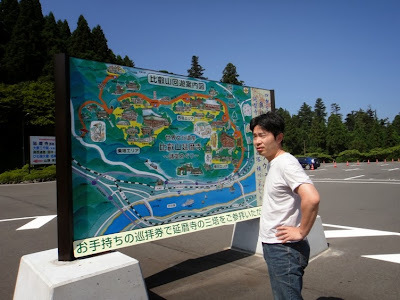 I will write about these visits to Sai-to and Yokawa areas in the next post.